The World is spinning around illusions, sometimes shameless lies. A key event in generating momentum for the first U.S. War on Iraq, "Operation Desert Storm" was a fraudulent report of the murder of Kuwaiti babies by Iraqi soldiers. On October 10, 1990, the U.S. Congressional Human Rights Caucus held a hearing on the subject of Iraqi human rights violations. The centerpiece of the event was the emotional testimony of a 15-year-old Kuwaiti girl, known only by her first name, Nayirah. Her full name was supposedly being kept secret to protect her from Iraqi reprisals. The girl relayed a shocking story while sobbing: "I volunteered at the al-Addan hospital. While I was there, I saw the Iraqi soldiers come into the hospital with guns, and go into the room where . . . babies were in incubators. They took the babies out of the incubators, took the incubators, and left the babies on the cold floor to die." Following the Kuwait war, human rights investigators attempted to confirm Nayirah's story and could find no witnesses or other evidence to support it. Amnesty International first defended the story ("believes there is compelling evidence of large-scale killing of incubator babies" 21st March 1991) and then (13 June 1991) reluctantly "examined the conflicting evidence and concluded that the story did not stand up", condemning as offensive the implication from Alexander Cockburn that financial interests had influenced their impartial advocacy of human rights. Nayirah herself has made no comment. "This is the first allegation I've had that she was the ambassador's daughter," said Human Rights Caucus co-chair John Porter. "Yes, I think people ... were entitled to know the source of her testimony." 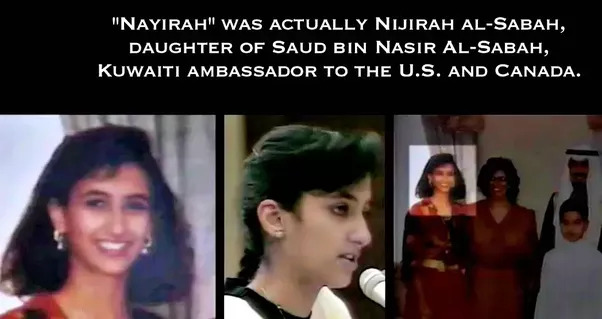 When journalists for the Canadian Broadcasting Corporation asked Nasir al-Sabah for permission to question Nayirah about her story, the ambassador angrily refused. Why this PR-campaign of a shameless lie? The lobby which govern the US government wanted war to any price. Say what you want about Americans, but as people, they never had a majority to join War. Later we will see how USA was lobbied in to the two World Wars. Before the first World War, US profile was a back drawn country, able to explore and make all necessary products between its own boarders. At least 50% of the American population were AGAINST to wage war against Iraq. The lobby who made the lies of Nayriah changed the public opinion. One of many emotional actress who cheat us.